Do you have unanswered questions about the Minimum Energy Performance Standards? In today’s blog we have answered some FAQs to help you to become compliant! As you may be aware, the deadline for the Minimum Energy Performance Standard (MEPS) legislation is fast approaching, and landlords now only have two months left to become compliant. Recently we have been asked many questions about the legislation, as landlords start to worry about becoming compliant before the deadline. We have answered some frequently asked questions to help you to become compliant. Who needs to comply with MEPS? Anyone who wants to let their property across England and Wales must comply with the legislation. If your property has an F or G EPC rating, then you will not be able to let your property, until you have increased the efficiency of the property, achieving at least an E rating. Properties across Scotland and Northern Ireland do not need to comply with the legislation. MEPS? I thought it was MEES? Is this another legislation I need to comply with? Both MEPS and MEES refers to the same legislation. 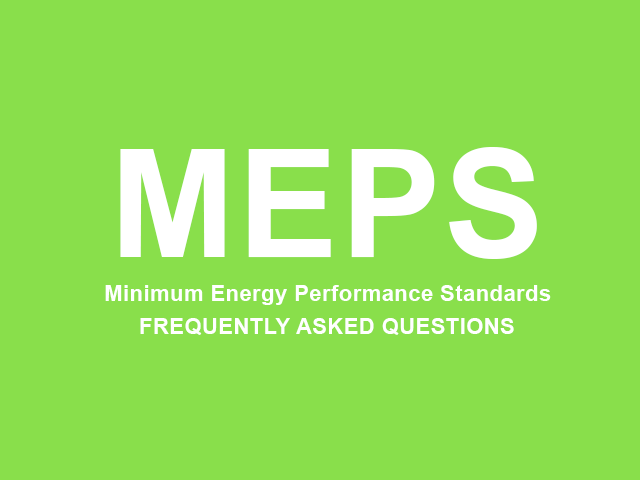 The legislation is known as both the Minimum Energy Performance Standards (MEPS) and the Minimum Energy Efficiency Standard (MEES) legislation, and both terms are widely used, which is where the confusion comes from. What if it is not possible for my property to reach the Minimum Standard even with all possible improvement works undertaken? In this case the landlord of the property would be eligible for an exemption, providing they have installed as many energy efficient measures as possible to reach the minimum standard. The landlord would need to provide details of the recommended energy efficient improvement measures that they have installed within their property. Whose Responsibility is it to decide if I need to comply with MEPs? It is the responsibility of the landlord to decide whether you need to comply with MEPS. You can seek advice for consultants, solicitors etc. however it is the landlord that will face the fine for not complying. If you have any further questions about the Minimum Energy Performance Standard legislation, please do not hesitate to contact a member of our team by clicking here, or sending us an email to sales@compliance365.co.uk.